The monsters of Alton’s childhood weren’t imaginary ones lurking beneath his bed at night. Very real, they erupted any time of day. They were his family and foster caregivers. Alton Carter will tell his remarkable story of survival when he speaks April 17 at the Friends of Children Banquet for the Circle of Care. Simultaneous evening events will be held in Tulsa and Oklahoma City. Today Carter directs the youth ministries of Stillwater-First United Methodist Church. He is a husband and the father of two teen boys. He’s a graduate of Oklahoma State University. When you learn about his early life, you want to cheer for the man he has become. His mother, single, disappeared for days. Starving, Carter and his siblings would go dumpster-diving for food. A nasty uncle forced the children to wrestle one another and to line up and drink alcohol. Roaches not only infested places the family lived. At school, the insects crawled out of Carter’s clothes. Violence, alcoholism, and crime rampaged in his family. Oklahoma Department of Human Services caseworkers came and went. Nothing changed. When he was 11, a desperate Carter ran away from home … and to DHS for help. That’s startling. News media seldom report that families ask the agency to intervene in their lives. Carter, who turned to the state for shelter, was sent first to a juvenile detention center! Years in foster care inflicted other terrors on the boy. A brutal man operated a group residence for boys, at a ranch. Punishments included bear crawling, the man kicking those who struggled. Another form of his discipline: moving armloads of bricks for two hours, with a quota required for that timeframe. Despite all, this neglected, abused child held on to dreams of change. His siblings and cousins "grew hard," Carter described. But he chose differently. Actions by a few compassionate people helped him endure and then avoid the statistical expectations for a foster child in adulthood. Carter describes those people in his book, "The Boy Who Carried Bricks" (The RoadRunner Press). This personal story is both unflinching and hopeful. He writes of the "bread crumbs" of kindness that fed his spirit. Those nuggets nourished his dreams of a better life and helped him achieve it. Today Carter tells his story to encourage others, both those suffering and those who can help. "I want to help people find strength to overcome whatever (challenges them). I feel like I am making a difference for people who are hurting," he said. "Dream; realize you can overcome; change. It’s OK to ask for help. It takes all of that." As the church’s youth director, he builds relationships, "and through that you can talk about God," he said. "God will put people there to help you." The Circle of Care is among those. The support of Oklahoma United Methodists makes possible the help extended by that agency to hundreds of at-risk children and youths each year. For information about the Circle of Care banquet: 405-530-2081, www.FOC.circleofcare.org. Carter’s life intersected with the Circle when a CoC official recently heard him speak to an audience in Ponca City. 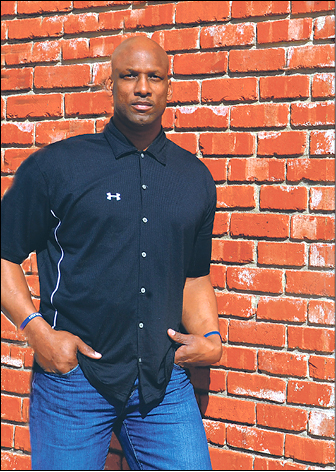 Alton Carter, youth director at Stillwater-First, is "The Boy Who Carried Bricks." He speaks April 17 at the Circle of Care banquet.